There are lots of Chinese congee restaurant in Jakarta, from the ones we see regularly at the shopping malls, to the ones located hidden and renowned only if you ask the elder locals. 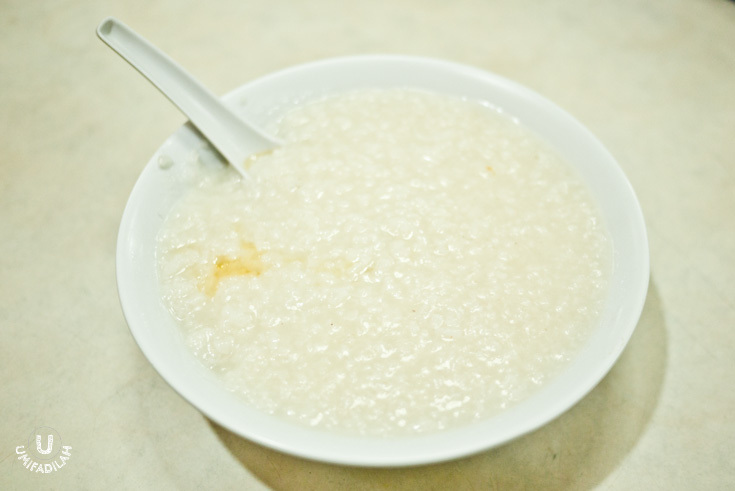 Chinese congee – or porridge (I have a dedicated post discussing about these two terms. #damncuriosity LOL), usually comes with a separate big plate containing varieties of topping to share, the common thing being steamed chicken, liver & gizzards, Phitan egg (century egg/thousand-year-old egg), cakwe, tofu, etc. The only places I've been to up until now are: Bubur Angke, Bubur Mabes (Mangga Besar), Bubur Sanki and Bubur Kwang Tung Pecenongan (for the latter two I don’t have the material yet so let’s save it for another round). I have never (thoroughly) traveled to West Jakarta, let alone entering unfamiliar area such as Angke, Kapuk, etc. So please understand that I’m bad at pointing out direction and I have zero confidence to repeat my visit to Bubur Angke if it wasn’t with friends who’s familiar with the area. 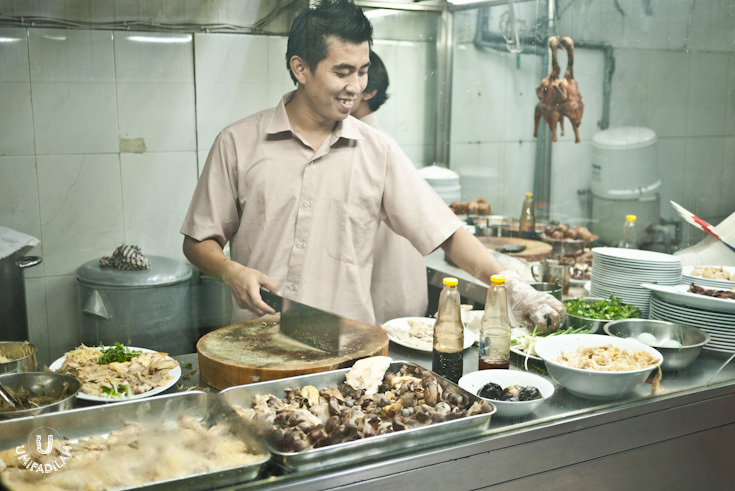 Bubur Angke is a humble stall serving only Chinese chicken congee, Hainan Chicken Rice and Bihun Bebek (vermicelli soup with duck). This is approximately the quantity of local free-range chickens that they use daily: 3 MEGA BUCKETS. Bubur Angke opens starting at 4pm onwards, but it’s only been half-an-hour since I came in, yet they’re almost running out of 1 bucket alone. Crazy selling rate like cold lemonade on a summer day, huh? 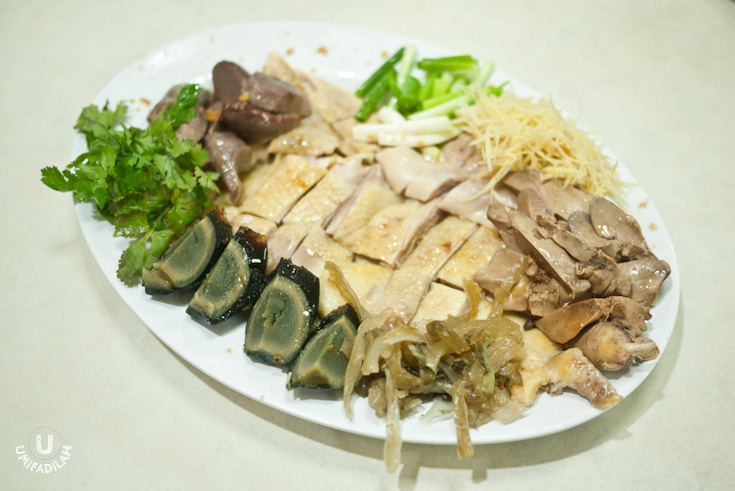 Phitan egg (century egg), half portion of steamed free-range chicken, chicken liver & gizzard – all cut into large chunks before drizzled with super generous soya sauce & sesame oil, then topped with Wan Sui leaves (cilantro) and fried garlic on the side. FANTASTIC! Everything was so fragrant, you know. Bubur Angke’s porridge has a slightly runnier consistency, and you can actually see the rice grains once spooned. It might be the only reasonable explanation on why I finish my bowl SO quickly, haha. In total, I spent around IDR 35-45k-ish per person. This is quite cheap compared to the rest of Chinese congee joint in Jakarta. My last visit was well worth it and I wish somebody would take me there again. Warning: very crowded, at times you have to yell to repeat your order but in the end, I'm a happy customer longing to go back! See the Foursquare location here. Opens from 4PM until they're running out (usually at 8 or 9PM). You can’t NOT notice this stall with its bold red signage and people coming in and out although it’s probably almost midnight. 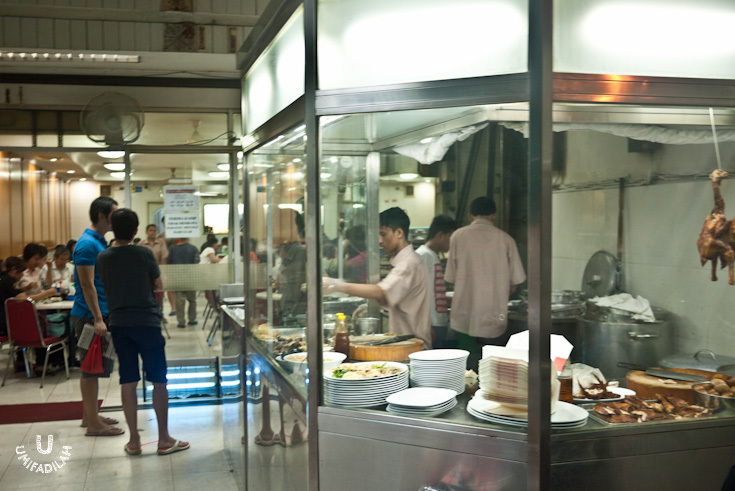 Located strategically at Jalan Mangga Besar I, where other Chinese congee vendors are battling out next to each other such as Bubur Sanki, Geylang Lor 9 (famous for its Chinese Frog Congee), let’s just say that Bubur Mabes never lose its crowd. They sell not only Chicken congee but also Fish & Squid congee + Hainan Chicken Rice. Other differences are: in terms of texture, Bubur Mabes has a thicker consistency and it’s ‘softer’ – means that you don’t actually see full-length long rice grains floating on top. Also, when you spoon to the bottom of bowl, taa-daa – not so plain, eh? 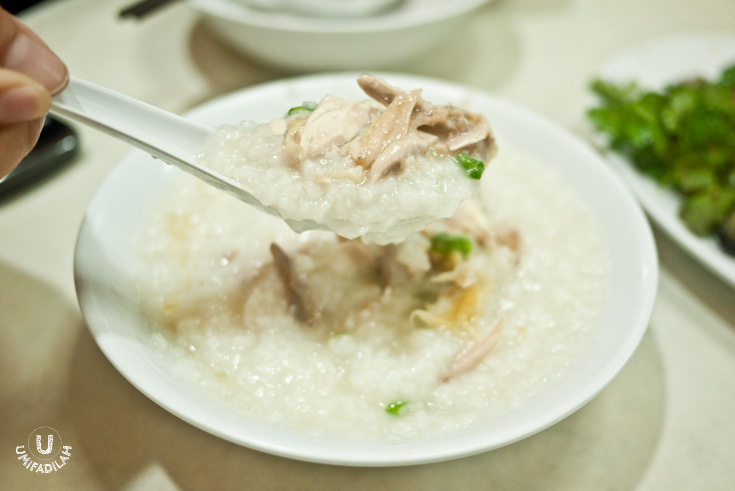 When you order ‘chicken porridge’ they translated it as literal as it should be – means, you will find shredded chicken meat in it. If you want a plain porridge, you have to request it to the chopping guy seen in front of the stall. In total I spent approximately IDR 50k per person (with standard topping selection as seen above). Slightly pricier than Bubur Angke, but you have more options in terms of topping. They also open twice a day for breakfast and dinner. In terms of food quality & blazing fast service, both are doing remarkably well. Price wise – both are good competitors although Bubur MaBes is slightly pricier. But if I can only choose one, I give extra credit to Bubur Angke because their complementary sides (steamed chicken, phitan egg, liver/gizzard, etc) is slightly tastier – they’re more fragrant & generous in sesame oil and soy sauce seasoning, which I really, really love. 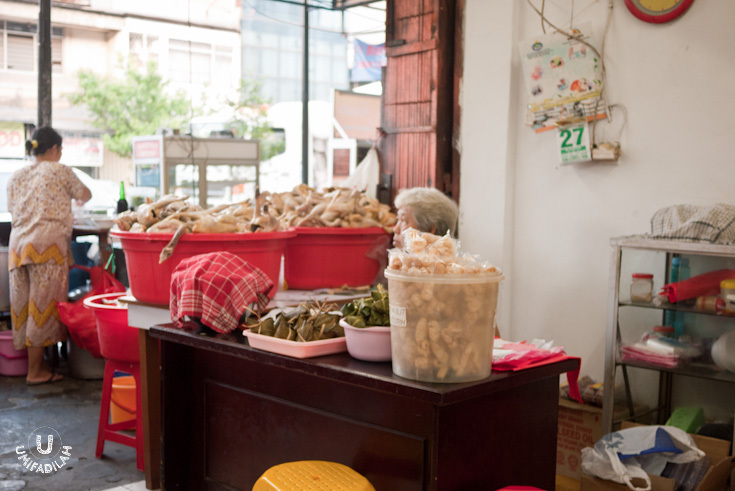 And the side-toppings such as wan sui leaves are very, very fresh. But location wise, to me Bubur Mangga Besar is more accessible since I’m having a hard time familiarizing myself to the West-Jakarta area and I don’t think I can go back to Angke without being lost *sigh*. Have you tried both? Which one do you think wins your heart better? Let me know!